TSgt.Bob Caron (October 31, 1919 to June 3, 1995,) the only defender aboard and the only photographer of the historic bombing of Hiroshima on August 6, 1945, tells his story: the mood and mentality of the pre-WW II era, most likely the last eye-witness account of the momentous event when the world was catapulted into the Atomic Age, the introduction of atomic capability, the technical development of the B-29, and the events that put him into the tail gun turret of the Enola Gay. Then fly with Bob on that historic flight. Foreword by B.Gen. Paul Tibbets, USAF-Ret. (pilot of the Enola Gay, coordinator of the 509th Composite Group and all phases of preparation and training for the mission). A significant assist for anyone interested in further research of the event known as the First atomic bomb, Hiroshima, etc., will be found in the bibliography at the end of the book. The sunrise such as the world had never seen began as a seed of reddish-purple light. In one-millionth of an eyeblink, the seed blossomed into a light not of this world, the light of a thousand suns in one. When the eye-stabbing flash penetrated the goggles intended to shield him, the tail gunner thought he had been blinded. At the signal nearly two minutes earlier, Technical Sergeant George Robert Caron had lowered the dense Polaroids over his eyes and tested them. The bright morning sun had been reduced to an odd, faint purple blob. Nothing more. Major Tom Ferebee spotted his aiming point, the Aioi Bridge, pressed the trigger on his Norden bomb sight and calmly, but deliberately, announced 'bomb away." At that moment "Little Boy" tumbled from the belly of the Enola Gay on its six-mile plummet earthward. Isolated by the blackness of his goggles, Caron counted the seconds after the bomb bay doors burst open. Freed of its five-ton burden, the B-29 shot upward. Instantly, Colonel Paul Tibbets executed the well-practiced, evasive maneuver calculated to put a safe distance between his crew of twelve and the unknown effects of the blast. No one, not even the physicists responsible for creating the world's first atomic weapon, could predict what its force would do to the specially modified plane. Or to a city of three hundred twenty-three thousand people. For Little Boy, there had been no dry run. Its deployment marked the first time in history a major weapon had gone into battle untested. ...On this brilliant morning, August 6, 1945, any one of her citizens whose eyes turned skyward would have seen only the golden glint of an aircraft, scarcely visible at thirty-one thousand feet. Air-raid sirens, which had cried wolf so frequently throughout the past months over a seemingly benign reconnaissance plane or two, had not yet screamed the plane?s presence through the stirring streets. At 8:15:17 A.M., Hiroshima time, their wonderings ended. In his shoulder-wide compartment, tail gunner Caron had been counting. Forty-one...forty-two.... Suddenly, without a sound, the pinprick of energy inside the bomb transmuted into a full-blown explosion. Light from a thousand suns crescendoed to a brightness that seemed to illuminate the universe. As though billions of years of creation had suddenly and inextricably reversed themselves, the sky ripped open. Within this tumultuous, man-made cataclysm roiled unfathomable temperatures. Just as it had been programmed to do, the bomb released its might eighteen hundred and ninety feet above the city. The explosion released fifty million degrees Celsius, turning matter to energy, mass to ash. Its core reached three hundred thousand degrees. At ground zero, directly below, there was no running away from the fire and fury. Objects were no longer real. Most ceased to exist. Trees, bicycles, tea pots, sleeping mats, houses, people. Vanished. Vaporized. Only occasional eerie shadows on stone, imprinted like photograms by the intense light, hinted the presence of once-living beings. Coursing eastward after its sharp right-turn dive, the Enola Gay raced away from what was. R.L. DiNardo, "The Historian," Air War College: Many of Caron's stories are quite charming, but there is also a good deal of technical information here. The...uninformed can learn a great deal in this book about the difficulties inherent in developing an aircraft design and bringing it into the inventory of the Air Force. This was particularly true of the B-29, which even at its best was a rather cranky beast to fly." Bob Beck, "Mora Advertiser": "In all likelihood, this will be the last book written by a member of the Enola Gay's crew about the first drop of an atomic bomb....The book traces not only the events of the drop itself, but the world-wide turmoil caused by the original splitting of the atom, the decision to secretly try to develop the weapon before enemy factions could, and the decision to finally use this weapon to hasten the end of hostilities." Homer Oudeis, "Stars and Stripes": "Not many men get to write their own epitaph. Bob Caron, the tail gunner on the Enola Gay on 6 Aug 45 when the B-29 dropped the atomic bomb on the Japanese city of Hiroshima, was one of the few...Fire of a Thousand Suns is not just a recounting of the Enola Gay mission. It is a tale of life in America during one of its most turbulent eras, and of an ordinary man caught up in a single event that transformed the world." Lt. Col. Carroll T. Andrews, USAF-Ret. "Officer's Call": "...A truly fascinating book has just been released. It is the story of the development of THAT (the Enola Gay) plane...I most heartily recommend reading (it) to military, active and retired...those around fifty years ago. 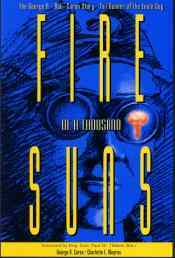 I highly commend Fire of a Thousand Suns for its honesty and revealing detail on personnel and technical developments of the Enola Gay, its crew and its mission to end the War."